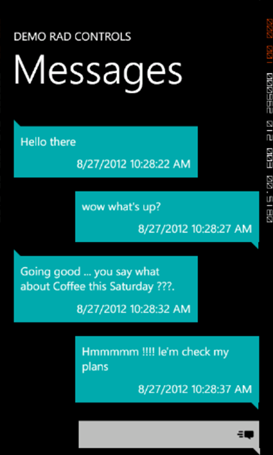 In this post we will learn to work with control for Windows Phone. This control allows you to get exact immersive experience of native Messaging Application in your own application. RadConversationView gives UI experience as following image. By default it takes accent color set on the device. To start working with this control first thing you need to do is to add reference of Telerik.Windows.Controls.Data on the XAML page. You can add reference as following. You need to pass following parameter in the constructor of ConversationViewMessage to create a message. Type of the message that whether it is outgoing message or incoming message. 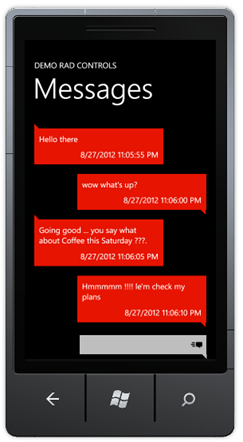 And in ConversationViewSendingMessage function a message can be added as given in below. RadConversationView control is very flexible and you can also perform following tasks.